Here we found a DOR King Cobra (O. hannah) and decided to see just how sharp the fangs were in a king this size. The result? The fang is hypodermic needle sharp! 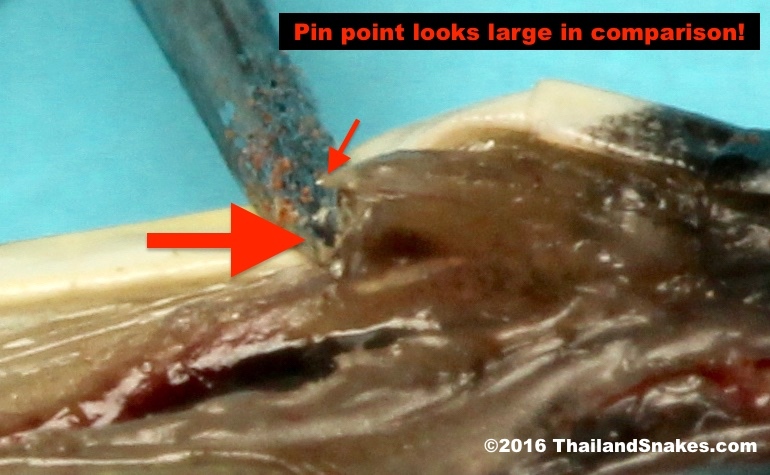 The little arrow points to the tip of the fang, and the large blob of the sewing needle is pointed out by the big arrow. Quite a difference! You can research something like this, or really, the topics are limited only by your imagination. Until recently we couldn’t give you an answer. I mean, you could have come on your own and setup everything yourself and try to find snakes and study them here in Thailand, but if it was your first time in the country, or if you weren’t really ready for what it entailed – you probably would have left Thailand with a bad taste. Answer: YOU CAN STUDY SNAKES WITH US. We are offering one month long snake internships so you can create your own snake research project. We have the ideal location and the knowledge to help you accomplish all the goals you set for yourself. We are not affiliated with a university. We don’t have PhD’s waiting around to help you design your research project. We’re not that kind of facility. We have the place, the time to help, and the local knowledge you’ll need to accomplish either your research project or other objectives. What might your snake research project focus on here in Krabi, Thailand? You could do a survey of a specific area of tropical rainforest for a period of 3 hours every night for 20 days and log all the data about the snakes, lizards, geckos, skinks, or other things you find in that specific location. You could catch as many Malayan Pit Vipers (C. rhodostoma) as possible and document the color variations in each. There is a great variety. You could help us determine if there are any safe snake repellants that might be useful for homeowners in Thailand. We get this question often and we are considering a study about this topic in the near future. We’ll help you to define your project – if you need it. Over 10 years we know the area rather well. We have a good idea what you might catch or not catch, and how to go about it, so that can help you create your reptile research project. Keep in mind, we say ‘reptiles’ and ‘snakes’ a lot when referring to this research opportunity, but we’re open to other animals as well. There is a thriving population of slow lorises close by that could be studied. There are many types of lizards, geckos, frogs, spiders, bats, and insects of all sorts you could choose to study. Here is MORE INFO on this reptile research opportunity!